As "non-foodie" as this is, I love the creamy Mac & Cheese that you can really only get with Velveeta. Love the stuff. And, to be honest, we always have it in the pantry, and when I make it I always replace it with my next grocery trip. I never want to be without it. That being said, I do feel guilty that I know I can make creamy stove-top Mac & Cheese on my own, without the processed cheese (is it even really cheese - I'll have to Wikipedia that!). I've just never had tremendous luck with a recipe that is easy and quick as well, too main criteria I have if I want to replace a box of Velveeta, since clearly that is easy and quick! Well, I've finally found it. I've been seeing a lot of people posting about Panera Bread's Mac & Cheese lately, and I've had the recipe saved for a long time to try even though I haven't gotten around to it though. With the plan of wanting creamy Mac & Cheese one night, I decided to finally try it out. I love Panera Mac & Cheese, so I knew that after reading the reviews on blogs that this was going to be very similar, meaning I'd love it as well. The recipe reviews were not mistaken. This was simply amazing. 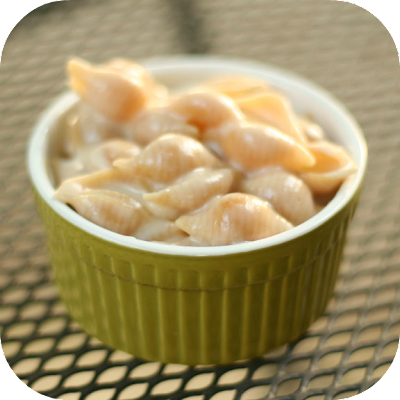 I love white cheddar anything, and the White American cheese really helps make this recipe creamier than many mac & cheese recipes I've ever tried. Regardless if you've ever had Panera Bread's Mac & Cheese, you need to try this. You will not regret it! Melt butter over low heat. Whisk in flour and cook 1-minute, whisking constantly. Add cheeses, mustard, salt and hot sauce, stirring until cheese melts and sauce is smooth. Stir in pasta and cook over medium heat for 1 minute, or until thoroughly heated. This is from panera's website and I just made it and it tastes nothing like the real thing. What a waste!